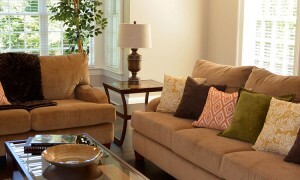 Home staging can be an effective and impactful way to make your home appeal to more potential homebuyers. Join us for a week of great tips and advice from professional home stager Talia Malizia. Contrary to popular belief, the process of getting your home ready to sell starts way before you actually put a yard sign into the ground. One of the often overlooked ways to prep your home for sale is to work with a professional to stage it before it hits the market. We believe that staging a home can be a cost effective and efficient way to help your home appeal to as many potential homebuyers as possible. And in a competitive market, it’s a fantastic way to help your home stand out above all others. We believe in the power of staging so much, that we’re dedicating this whole week to staging! And that’s just scratching the surface! Talia also put her tips and suggestions to the test, as she staged a stunning new home for us in Livingston, New Jersey. Whether you’re thinking about selling your home in the near future, or are interested in sprucing up your home, we’re hoping you’ll find all the content being shared this week useful. Join the conversation throughout Staging Week by commenting on each video and engaging with us on Facebook and/or Twitter. A staging expert shares a few tips to get your home ready for prime time.